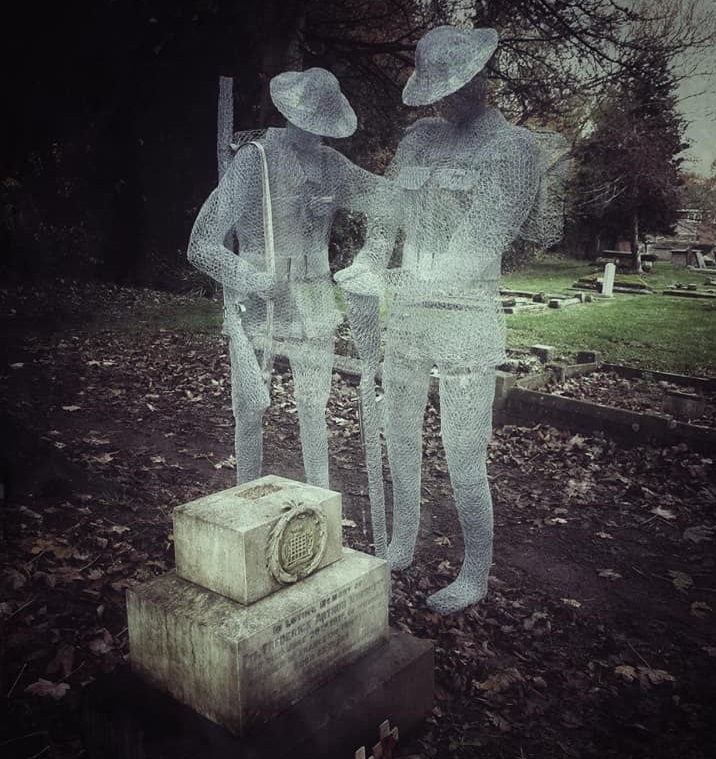 You may have recently seen a photographic collection of beautiful sculptures; ghostly soldiers standing silently in a graveyard, ethereal yet somehow real. Each sculpture represents a real man, one of the many fallen. The photos were what caught my eye, of course. You’re immediately drawn to them, and I messaged Nikki Phillips the photographer straight away, asking about the creator and about her own photographs. We chatted a bit and she helped me track down the sculptor, Jackie Lantelli, in Slimbridge, Gloucestershire. I’d wanted to find out more about these otherworldly characters. I got lucky. Not only did Jackie agree to tell me all about them, Nikki kindly let us use her photos. “I enjoyed doing the photos,” said Nikki. “I love playing around a little bringing out the best light and atmosphere, tried to capture what it felt like. The wire sculptor usually makes sculptures of fairies and wildlife. But after an experience of her own, she has a passion for Remembrance Day and wanted to do something to mark it herself. “A few years ago I took my friend Brigadier Stanley Baldry, 93 years old, to London because they had a special event to commemorate the end of the war in Burma,” Jackie explains. “Driving to London Stan kept saying things like, “There won’t be many there, after all most of us are dead now,” and “there won’t be many there, they did call us the forgotten army you know”. “When we got there the streets of London were full; thousands, people calling out thank you, we love you, thank you. When I looked at Stan he had tears streaming down his face, he was absolutely amazed and in such a quiet voice I could hear him saying to himself, “They remembered. They remembered”. “That’s why I feel we should all do what we possibly can to help keep their memory alive. After all, they made the ultimate sacrifice. 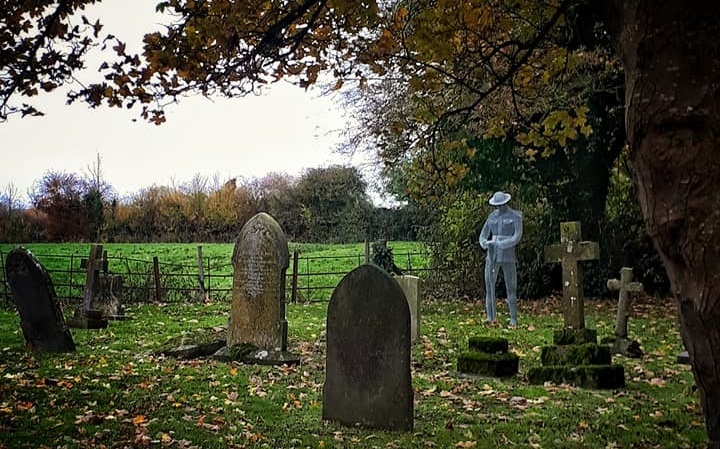 “So one day I was out walking my dogs and I started talking to Den Banister who lives in our village and is head of the local history society, and he told me that he had some ideas for this Remembrance Day. He said that he was going to make some soldiers out of wood, that’s when I had the idea of making them out of wire. So I made a couple and we invited the vicar, Reverend Boon, to have a look. We thought he might take some convincing but he was really great about it and gave us the go ahead. The sculptures aren’t just generic characters though, they represent real people. “I wanted to do this for the village; we are a close-knit village, and if anything special is being planned we all muck in and do what we can. Along with the sculptures the historical society had researched all of the lives of the soldiers, and created notice boards so that you could see where they lived, where they went to school, what jobs they did, and what they did in the war. Jackie says she had no idea what an impact the works would make; something that Nikki says too. Her photos have been shared over 333,000 times at the time of writing, demonstrating not only how beautiful the images and sculptures are, but how much we still all remember, and honour. The comments bring tears to the eyes, and that oft-casually used phrase, ‘Never forget’ is soundly represented here. “When I started this project I thought it would go no further than the village,” said Jackie. “But once I had made a few I thought this is going to be a bit special it might get in the local Gazette. I had no idea that it was going to create this much interest, I must say I am absolutely amazed at the affect it’s had. “Creating them has been emotional. I remember making the sculpture of the Wherrett brothers (one has his hand on his brother’s shoulder, as if to comfort him) and when I had finished I just sat on a chair looking at them and cried. After such an extraordinary project we asked Jackie what she had in mind for her next project. “I have a couple of ideas for next year but will keep them secret for now,” she says. We will be keeping our eyes peeled.